Do not let the uncomfortable chilblains limit your day-to-day life! 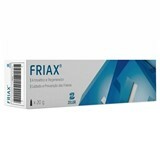 Friax is the ideal care for the prevention of chilblains with antiseptic, rubefaciente and moisturizing action for, day after day, recover all comfort and health. FRIAX - Because the chilblains need a quick and effective solution!